Step 1: Do you need a wellness blog? Step 6: Ultimate health blogging checklist! Signing off and toasting: To using these health blogging resources and rocking your blog in 2019! Originally published Dec 2017, updated with more awesomeness March 2019. Here’s a bunch of quality info to help you stand out in the massive and growing online wellness industry. 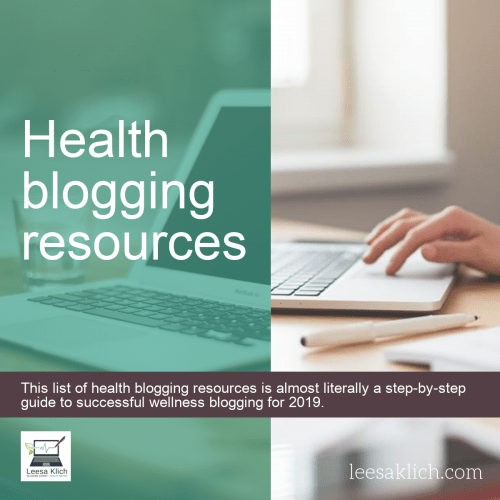 This list of health blogging resources is almost literally a step-by-step guide to successful wellness blogging for 2019. HINT: Bookmark this page and come back to it! Please use these resources. You can really rock your wellness blog in 2019 if you make a commitment and follow through. Skeptical of new health study? Enjoy using this checklist to the fullest potential to rock your health blog in 2019 and turn it into a content marketing machine! Don’t have time to read it all? Download just the bullet points in the checklist now. Take these resources and use them. This time next year, you will be glad you did! And I will too! Is something stopping you from rocking your wellness blog? What is it? Please tell me so I can help you – I want your 2019 health blog to be amazing!